GM had a rough last year after it went through two CEOs and a bankruptcy. Part of the bankruptcy has been a groundswell of people who are angry with GM's decision to ask for government money so it is no surprise the loan payoff announcement last week was big news to hopefully win back customers angered by the government handout. But was it really a loan payment or simply "an elaborate TARP money shuffle," as Senate Republican Chuck Grassley claims? The issue is in regards to TARP funds being used to make the loan payment last week. The Troubled Asset Relief Program (TARP) was designed mainly to give money to financial institutions in exchange for future equity that government hopefully can recoup in the near future. In GM's case stock shares are given as equity when the company goes public, possibly later this year. Basically, TARP is a loan against poor assets or to some a bet on future potential of the company. Grassley and others think GM simply took $6.7 billion of its TARP money to payoff the $8.1 billion in loans it took. This is not sitting well with those who feel the company simply shuffled borrowed government money around to give the impression the government was paid back. Of course, the email message above says nothing about TARP funds being used or that the government is still owed a significant amount of money it hopes to get some day from the equity the government know owns in GM. Sorting this all out gets a bit complicated. According to the New York Times, "about $43 billion that G.M. borrowed from the Treasury has not been repaid because it was converted to a 61 percent equity stake in the company. That money can be recovered only through a public stock sale, which is expected no sooner than the fourth quarter." So was this simply a government money shuffle and more importantly does it matter? Looking at last week's news coverage and GM's email it appears the government has been paid back and GM can now rest nicely without a government debt hanging over them. Any questions regarding GM's debt can now be dealt with as GM has given the government equity in the future company which sounds a lot better than owing a loan. 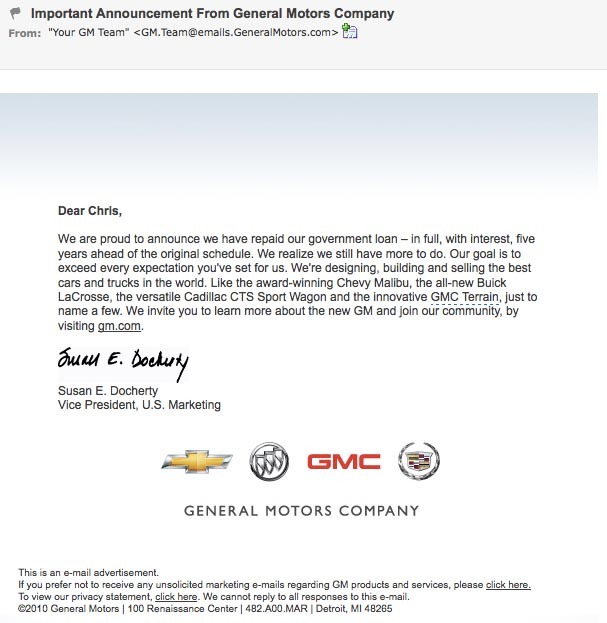 I personally think the news went very well for GM and the email was a smart touch. The only issue is will people like Senator Grassley be able to make enough noise to cancel out the positive press? 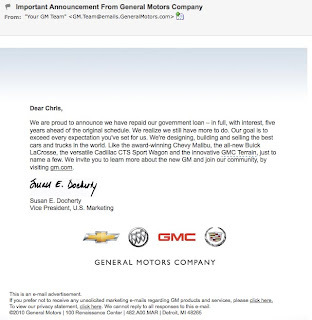 * It's tough to say who received the email above, but I'm sure I did due to signing up on a vehicle site for updates or some other GM site that asked for my email. I am not an owner though. It does seem like a shuffle. However, if it brings up the perceived value of GM, then the eventual IPO should truly bring in enough money for the government (us) to recover the money put into the new GM. Am I certain of this? Nope. This is definitely complex and the average Joe isn't going to understand all the machinations behind the curtain on Wall Street. For me, it's not so much the act of shuffling around the money or whatever they did. What bothers me is that it would appear GM is spending taxpayer dollars to GLOAT about paying back taxpayers' dollars. As you know, TV advertisements are hugely expensive - and the new GM commercial is running on all the major networks during prime time. It would have been sufficient (I think) - and wildly cheaper - to spread the message through free media such as GM's website, social networks, op-eds and cable news outlets. The email is good, but falsely confident. I don't think GM emailed all of their consumer contacts when they took the TARP funds, so they aren't disclosing the full story (regardless that most people know about their loans because of the news surrounding it). Unfortunately, despite GM taking a step forward, the average consumer probably won't have a clue that GM isn't as "out of the hole" as it claims to be. You can call that smart marketing, or you can call it a half-truth. Regarding the Docherty e-mail, I received the same message. I'm sure it went out to both owners and prospective buyers. I don't get why GM needed a bailout, they are such a massive company, surely they could have raised some money from external investors?